This website is managed by Threebyone Europe AB (hereinafter referred to as Neuw or we). Following terms apply to all users of neuwdenim.eu. The terms are valid for all future transactions between you and neuwdenim.eu. These terms and conditions apply to sales of jeans or other products by Neuw to private individuals. Neuwdenim.eu is directed exclusively to private individuals. Neuw reserve the right to revise these terms and conditions. Neuw offers free standard delivery on all orders above 150EUR. Orders below this level will be charged a shipping fee at checkout. Orders placed outside Sweden will be shipped with FedEx with estimated delivery time 3-7 business days. Please note that delivery to rural addresses can result in longer delivery times. Each purchase is insured by Neuw during the time in transit until it is delivered to you. Signature upon delivery is required for all orders. The responsibility passes to you when the delivery is signed. All products on neuwdenim.eu are bought in EUR at checkout. For you convenience we show the prices in your local currency based on current conversion rates. We accept all major credit cards, Paypal and Apple pay as possible methods of payment. Neuw do not charge your credit card until the date of the shipment, meaning when the package is dispatched. However, the order amount will be captured from your account immediately by the time you place your order. The following credit cards are accepted by Neuw via the global payment gateway Stripe: Visa, Mastercard and American Express. Payment is debited from your account as soon as you place the order but will be charged on the day of shipment. For customers that pays with PayPal. Paypal stores your card and bank information, enabling you to pay without sharing your payment details with Neuw. Neuw accept exchanges and returns of orders within 14 days following the delivery of your order: any unwanted items must be shipped/postmarked within 14 days of receipt. You must return the items in unused condition. Neuw will only accept returns if labels and original packaging are fully intact. Neuw is not responsible for the items during shipment back to the Neuw warehouse. The return shipping fee is carried by the customer. If you should wish to return or exchange an item, you must request a return authorization by contacting us at contact@neuw.se and within 14 days following the delivery of your order. State your order number and the name of the item you wish to return. Once you have received a confirmation from us, please send the package to the address below. Furthermore, we do not offer return on products from limited edition collections. Purchased items are only exchangeable into a different size and color upon receipt of returned merchandise and are based on stock availability. Exchanges are shipped to you free of charge. Should you be interested in a different item, please return your item/s to Neuw and simply purchase the new piece separately at neuwdenim.eu. Your refund will be credited to the original purchaser’s credit card. Neuw will issue a full refund if the complete order is returned. Please note that Neuw will not refund the return shipping fee. In case we receive a written notice and proof of return within 14 days upon arrival, Neuw will issue a refund latest on day 14. In case we have not received a written proof of a return, we will allow 30 days to issue a refund. Failure or damage caused by improper use or carelessness, esthetic changes, defects and damage due to normal wear and tear and aging. Neuw cannot guarantee that all items displayed at neuwdenim.eu are in stock by the time of your order. In case an item of your order is being out of stock, we will contact you by phone or e-mail. Neuw cannot guarantee that the content of neuwdenim.eu is at all time free of inaccuracies or typographical errors, and up-to-date. Neuw is allowed to, at any time, change the site’s content and items available in the product range. Errors may occur, even though Neuw always strive to display the correct texts, images and pricing on the site and web shop. In case of you being charged the wrong amount when shopping from neuwdenim.eu, we will give you the option of placing a new order with the correct price or canceling your order. If we can not get in touch with you, we will cancel your order automatically. Neuw cannot be held responsible for any damage caused from using the site or from not being able to use the site. A problem-free, uninterrupted and secure access to the site can not be guaranteed by Neuw. The copyright in the documents (including, without limitation, the trademarks of Neuw, logos, graphics, photos, text, design, icons, images data and software) provided in this web site are owned by or licensed to Threebyone Europe AB and its affiliates. You are authorized to use material from neuwdenim.eu only for personal, non-commercial use. You may download, print and store copies of this material for your own personal, non-commercial use, provided this copyright permission notice is included in all such copies. You may not charge anyone for use of the material and you may not publish, retransmit or otherwise distribute the material to others, without prior written consent from Neuw. You may not modify the material in any way, without prior written permission from Neuw. Except as expressly stated in this legal notice, no rights or licenses to the material, or any portion thereof, shall be granted or implied. Neuw is responsible under the Swedish Personal Data Act (1998:204) for the processing of the personal data which you as a customer provide us with. By providing us with your data you consent to Neuw using the collected data to fulfill our obligations to you, thereby providing you with the highest level of service possible. The aim of the processing and registration of your data is solely to prepare, process and complete your order, to improve our customer service and for marketing purposes Neuw will not transfer your personal data to any third party for the purpose of marketing. Neuw recognizes the importance of protecting our customers’ privacy. We ensure that all information that you provide us with when using our services on neuwdenim.eu are protected. 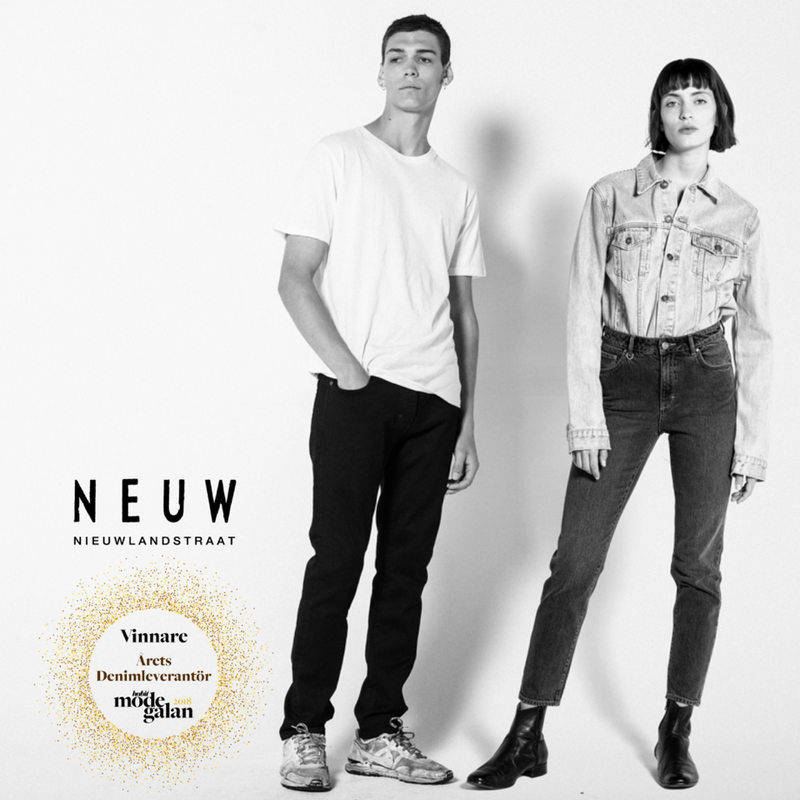 The latest update of the Terms and Conditions of neuwdenim.eu was made in May, 2018.